For most of my life I’ve sought harmony. This quest probably intrigues the vast majority of people looking for answers. What is the meaning of life? What is life? When is life worthy of being lived? How do I find peace of mind? In the past few years I’ve gathered some critical life insights – my life principles. As part of my personal transformation, maturing over time (some might call it getting older, and hopefully wiser), moving through the quadrants, changing from scared to healthy again, I have found these principles have helped me to get energised. While these principles alone won’t solve the big problems in the world like global warming, terrorism and the plight of millions of refugees, applying some of them will make you more energised to contribute and cope with what you see. Traditional linear thinking is insufficient. The journey is never complete; it shouldn’t end. It is personal and it can mean different things to different people. You will no doubt find other principles. Read through mine, use what works for you, decide which ones you would like to follow. I learned over the years that living in harmony with disharmony can be harmonious. When we’re perfectionists, like many people are, we try to harmonise with everything we have – harmony in our inner-circles like family and friends, harmony in our business life and in building relationships with our colleagues. Finding balance in our mental and physical health. Finding harmony in our digital life through Facebook and LinkedIn. Seeking harmony in our personal and business transformation. Keeping up with start-ups and disruptors to develop our businesses. We search for balance in everything we have and do, and all of this demands hard work. If something is not harmonious, we may get stressed and invest a ton of energy to get everything back to balance, as if reaching an ultimate level of harmony is even feasible. People naively believe this is what they need to be happy, well-respected and have meaning in life. But life is not like this. We need to figure out what’s important if we want to survive in this world, control what we control. We need to start by being comfortable with being uncomfortable. When we reach that point, something happens – that’s when we’re vulnerable and open for change; open to receiving things that are different. Once we accept this, we will save so much energy, gaining strength and vitality and making us better people. The heaviness of trying to find perfect harmony will soon be replaced by the lightness of living in harmony with disharmony. Accept the Dualarity of harmony in disharmony and you’ll live happily and find peace of mind. I had an aha-moment when I discovered that there is no such thing as work-life balance – work is life and life is work. The perceived work-life balance gives the impression that we only live outside of work and stop living when we work. Work should be life, and if it’s not then we have a problem. Work is a duality where fun, engagement, happiness is equally as important as hard work, targets and results. And in the Fourth Industrial Revolution we ask everyone to perform while they transform, but whatever happens, work has to be life. If work is not life, change, do something different. At the end of the day, you should have the choice. Life is too short. It might not always be what we expect of it at every moment, but time is the only life ingredient that can’t be extended by an app. Use your time on this planet wisely; every minute counts. Live your life with your heart and soul, with energy and passion, and while doing so try to take care of the planet as we only have one. Don’t let other people or society determine what you need to do, how you need to live and who you need to be. Always stay true to yourself, and don’t sacrifice that for anyone. I love people not for what they do but for who they are. In his Stanford University commencement speech, Steve Jobs, CEO and co-founder of Apple and Pixar, urges us to pursue our dreams and see the opportunities in life’s setbacks – including death itself. Don’t copy other leaders, don’t copy other businesses or the Ubers of this world, don’t copy Silicon Valley. Instead take the learnings, give them your own flavour and make them your own. Be a constant learner, and never stop learning. Start doing some reverse mentoring with the Millennials and Generation Z. Open your mind and be receptive to new things. It’s lifelong. It never ends. Be curious. Digital seeing will need to be an everyday play. Don’t be a know-it-all, be a learn-it-all. ‘If you only do what you can do, you’ll never be better than what you are’ – a great quote from Master Shifu in Kung Fu Panda 3 where he is asking Po, the Kung Fu Panda, to try something different, go outside of his comfort zone, grow and learn a new skill. In my opinion, work has to be what makes you tick and gives expression to your passion. You have to invest in life and get a return on those investments, so do everything with passion and follow your heart whenever possible. It is like gardening: nature gives you back what you invest in it. Shoot for the heart and the mind will follow. Share your passion and you’ll make others sparkle with you. When you do anything with passion, with emotion, with energy, other people feel it. They also feel it when you don’t. So play from the heart, put emotion into everything you do. It will make your organisation and yourself more resilient to change. Passion equals learning, learning equals knowledge, and knowledge equals respect. And this respect needs to be mutual to succeed. My number one criterion when hiring someone is not to look at their business or educational background, but to look for the sparkle in their eyes. The same applies when meeting new people. In French there is a beautiful expression ‘Les yeux qui pétillent’, in English ‘The fire in the eyes’. To grow and to be happy, we need to find sparkle at home and at work. Without it, we are just living a life. Nothing more, nothing less. Find your purpose and you will find your sparkle. Don’t expect a big play at the end of your life as life is not a rehearsal. Many people I know seem to have a dream that once they stop working, they will do all the things they ever wanted to do. They have their bucket list ready for when they reach their sixties. Live in the now, and for tomorrow. The journey is the true reward. Be mindful of today. When people hit their sixties, they will probably have some physical limitations or other constraints, so don’t wait. My generation will be working until we’re seventy, the next generation will be working until they’re eighty. Life is not a rehearsal. Seize the opportunity, seize the moment, live in the now. The healthy leader or person. Many industry leaders and authors talk about being a strong, efficient, effective, thoughtful, productive leader or person. So many strategies, frameworks, approaches and training opportunities are available to support us. But to become such a leader or person, we first need to be healthy, as leadership and wellbeing go hand in hand. I talk about the golden triangle of a healthy person: sleep, nourishment and exercise. 1. Enough sleep is the starting point, as Arianna Huffington wrote in her new book The Sleep Revolution: Transforming your life, one night at a time. Her research showed only 1% of us have the right genes for three to five hours to be enough sleep; the rest of us, 99%, need between seven and nine hours. She talks about being in the middle of a sleep-deprivation crisis impacting every aspect of our health. 2. Physical health is mental health. Invest in your health. Make time to exercise, but don’t deprive yourself of sleep in order to do so. Too many people wake up very early to exercise and create their own sleep crisis. Exercise is an excellent way to boost our mood and get in shape. When we exercise, our body releases chemicals called endorphins which interact with receptors in our brains that reduce our perception of pain, triggering a positive feeling in the body. This results in an energising outlook on life. The ancient Greeks did their thinking while walking. Walking gives us energy, refreshes ideas, and we meet people while doing it. At the office, don’t sit in your chair the whole day; walk around. Some say sitting is the new smoking. Perhaps install offices without chairs or with only standing desks. 3. And last but not least, find the right nutrition – such as less coffee, less alcohol, more vegetables, fruit and water. The most important meal of the day is breakfast: it strengthens your immune system, slows down ageing and fights cancer. Don’t force yourself into a fixed diet as a temporary solution, but eat and drink healthily in a way that you can continue for life. Do everything you do in nutrition with moderation; don’t be obsessed by it. Make the wellbeing golden triangle of sufficient sleep, nutrition (regular and healthy meals) and exercise part of your daily DNA to find the right pace in this accelerating life. Don’t do it out of guilt, but because you believe it necessary to become the leader that people are waiting for, the one who can show the path to others. A Harvard Study of adult development, the longest study of adult life (seventy-five years!) that’s ever been done, showed that good relationships keep us happier and healthier. Not money, high achievement or being famous. 3. Good relationships don’t just protect our bodies, they protect our brains. Our mobile device might be our remote control to a digital life, but it is face to face relationships that define our health – relationships that we need to humanise, personalise and re-energise at all times, and never take for granted. Nurture, respect and develop good relationships in all areas of your life. 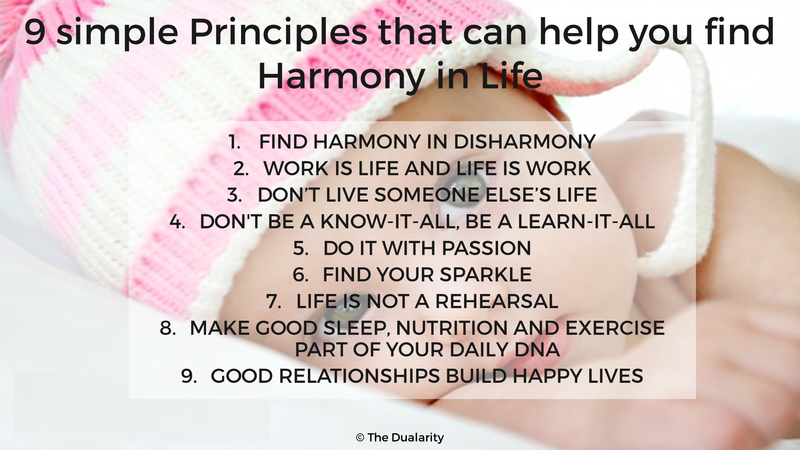 9 simple ‘Dualarity’ principles to transform your personal life. For you to decide which ones you would like to follow to find more harmony in your life. If you would like to read my past or future posts then free to connect via LinkedIn, [email protected] or Facebook. You might also be interested in my book The Dualarity or visit www.thedualarity.com. As international Public Speaker, Trend Sensemaker, Executive Whisperer, Innovator and Author, I help businesses to take the pain out of their personal and business transformation, leaving them with a regained sense of spark. Olivier is former international Microsoft executive (22 years) and since 2 years founder of The Dualarity, a business and a book, on how to find the balance between performing and transforming in life and business. An international public speaker, trend sensemaker, executive whisperer, sparkle builder, corporate innovator and author, Olivier is a thought leader on personal and business transformation, innovation and on the impact of the changes around us on our society and industry.